Other than a few fanciful legends, nothing factual is really known about St. George. The most popular image of him is that of a knight on horseback who slew a fire-spewing dragon and rescued the king’s youngest daughter who was about to be eaten. After climbing onto the horse, the princess joined St. George in “draggin’ the dragon” to town with her garter wrapped around the beast’s neck. After cutting off the dragon’s head, St. George persuaded the king and his subjects to be baptized. The king offered his recently saved daughter’s hand in marriage but St. George rejected the offer to pursue another adventure. This 12th century legend was influential enough to get St. George named as the patron saint of England, and defender of the Order of the Garter. (An ancient recognition of chivalry and highest loyalty still granted by English monarchs today). Franciscan Father Leonard Foley, editor of Saint of the Day, wrote that St. George has become the object of a vast amount of imagination. “The Church adheres to his memory, but not to the legends surrounding his life,” Father Foley said. The persecution of Christians under Datianus, or Diocletian, was very brutal. As a result, many early Catholics had become reluctant to experience the horrors of martyrdom. Because of this fear, St. George was concerned that Christians were reverting back to paganism. He walked into a public square one day and, in defiance to the local Roman authorities, openly proclaimed his Christian faith. The Romans then tried killing him, unsuccessfully, several times. First, they cut his body into pieces and buried it but Christ reputedly brought him back to life. Next, they boiled him in molten lead; he survived. They then placed him between two spiked, rolling wheels but he survived. He was then forced to drink a deadly poison; he survived that, too. Finally, in a desperate attempt to kill him, they beheaded him. At the moment of his decapitation a firestorm rained down on his attackers and killed them all. According to The Catholic Encyclopedia, legend further claims that at the moment St. George was finally killed, dead men were brought back to life to be baptized, wholesale conversions happened, armies and idols were destroyed instantaneously, wood beams burst into leaf, and milk flowed from the severed head of St. George instead of blood. 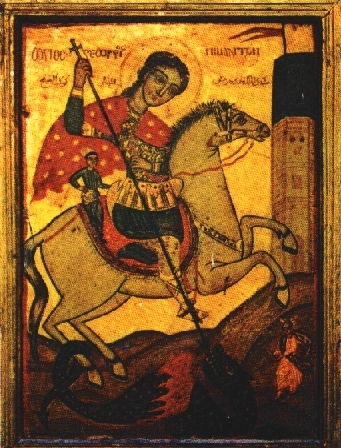 A following devoted to the memory of St. George developed in northern Africa and southern Europe around the sixth century and later spread northward to England. 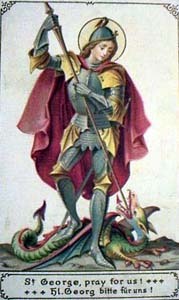 St. George, through intercession, has also been credited with helping knights during the crusades in the Middle Ages.